I am a nerd by nature, and making a pixel quilt has always been on my list of things I want to make so when Quiltoni asked me to be a part of her blog hop to showcase her new book I jumped at the chance. 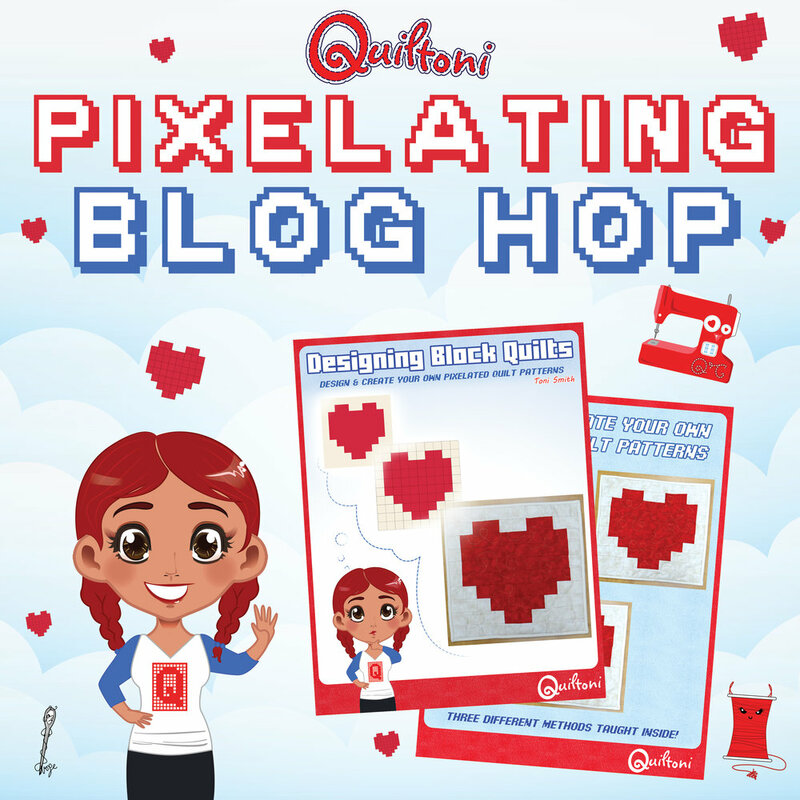 She has written a book called Designing Block Quilts that will help anyone make their own pixel quilt from scratch. It contains methodologies, tips, and tricks to help you make your own unique creation from start to finish. Now there are so many things I could have picked and my first 2 ideas fell through and ultimately I settled on doing something from the Mario universe. Lately I’ve been looking for projects other than quilts to make just to add variety to my world, so my plan was to make a 20” 1 up Mushroom pillow. This would make the pieces manageable and not too small since they would finish at 1”, and there would be 2” of border. Then right after Thanksgiving I took a class to make the Seaside Traveler Bag. That was the begging of the end. Seaside Traveler Bag with kitty for scale. Because the bag was so large, I had enough space to place something pieced on the bag, and that is when the insanity started. I got into EQ8 and mocked up the outside panel, and since there were 2 sides, of course my green mushroom turned into a red and green mushroom. Then there was what was going to go under the mushroom which because a brick wall! I could have gone on forever. I even mocked up one where I had a cloud and a bush (matching shapes of course), but that became a bit busy and I was already pushing my limit of what I could get done. Putting the mushroom on a bag instead of a pillow meant that instead of the 16” Finished (16 x 16 pixel) mushroom I had originally planned, my mushrooms would have to be 8” Finished (16 x 16 pixel). So my finished pixel size went from 1” finished to 1/2” finished. As you get smaller the margin for error in your piecing also shrinks. This did not deter me though. I got my fabrics, and, after sitting down with some graph paper I ultimately decided on the Quiltoni method to cut and assemble my mushrooms. Using the graph paper really helped me to be able to make a detailed cutting list and be organized and deliberate, especially since my blue had horizontal stripes in it, and I had to pay attention to that when cutting so the strips keep going the same direction. You can see it well in the picture below. After cutting I laid them all out and got to sewing. Sadly, I do not have a finished bag to show yet, but I did get both of my mushroom pieced, and all the seams line up and I’m thrilled with how they turned out. This is just what I get for changing course so close to the blog hop. I will be working on the bag and trying to get it done before the end of the blog hop. I really want to do this right, and I’m resisting the urge to go crazy and put bushes and clouds on the inside above the wall pockets. Thank you for taking the time and read about my creation for the Pixelating Blog Hop. Please be sure to visit all the other participants, and don’t forget to enter the giveaway!